The club has eight Topaz dinghies. The Topaz is an versatile dinghy suitable for both single handed or two person use. A couple of these are rigged for competitive racing, but all are great fun. Click here to view a Topaz brochure. The Wayfarer sailing dinghy is a true CLASSIC and is a safe, secure dinghy for up to 4 people recently refitted complete with new sails. Please note that the Wayfarer is a large dinghy and you may need help in recovery at the end of your sail! Click here to find out more about the Wayfarer. 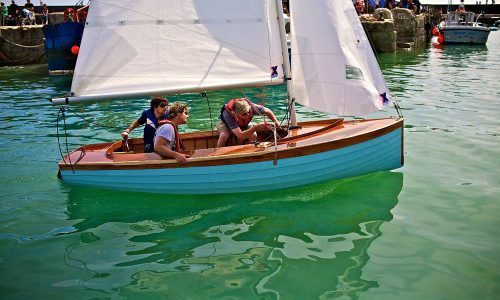 The latest addition to the club fleet, this tough 14′ sailing dinghy has been recently refurbished and equipped with good sails and a new 3-wheel trolley. 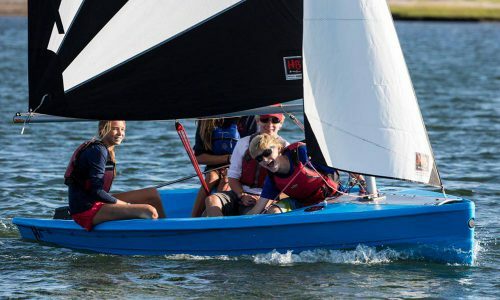 Designed as a training boat, this dinghy is very forgiving for the less experienced helms person. Click here to visit the YWDB site.